Merrybeth Farm offers select products for your enjoyment. All are fresh, wholesome, and made or grown with loving care. At Merrybeth Farm we have eggs from happy farm-raised hens. Our handmade Merrybeth goat milk soap and lotions get rave reviews. You'll love the flavor of our farm fresh eggs. Our hens are part of the Merrybeth family. They're raised in a caring environment, with the kind of food that helps make their eggs super tasty. 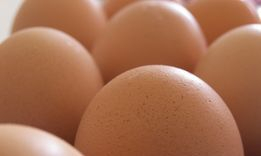 So step away from the big grocery store's selection of eggs and join the Eggcetra community here at Merrybeth Farm. You've seen the goats. 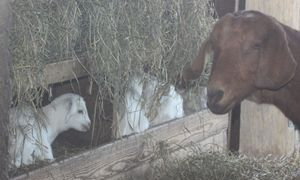 Not only are they cute, but here at Merrybeth Farm that rich goat milk is turned into goat milk soap. It's made by hand, with a great deal of pride and love. It's luxurious. It's moisturizing. It doesn't contain harsh chemicals and additives. 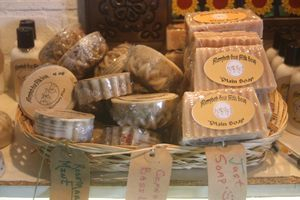 Goat milk soap is full of essential nutrients and vitamins that are easily absorbed by the skin. Maybe our goat milk soap can't turn back the clock, but wait until you notice how smooth and healthy your skin can feel. Be sure to pick up a few bars for friends. At Merrybeth Farm we also turn that rich goat milk into goat milk lotion. It's a small batch wonder that is luxurious and moisturizing. 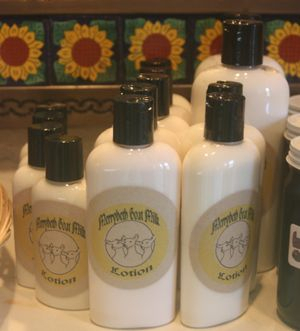 Merrybeth Farm goat milk lotion contains no harsh chemicals or additives. Many of our customers love the healthy smooth feel of their skin after using this delightful homemade lotion. Be sure to pick up a few bottles for friends. Curtis Orchard and Walnut Street Tea Company in Champaign Illinois.